Text: Origins. This hymn by William Whiting (1825-1878) was written in 1860 and adopted into the first edition of Hymns Ancient & Modern (London: Novello, 1861), with revisions by the compilers (Fig. 1). Fig. 1. Hymns Ancient & Modern (London: Novello, 1861). Whiting’s original 1860 text was given in Louis Coutier Biggs’ Hymns Ancient & Modern . . . with Annotations (1867 | Fig. 2). In this publication, the revised version appeared on the left, with the author’s original text on the right. From this, we can see Whiting began his hymn with the line “O thou who bidd’st the ocean deep,” whereas the line “Eternal Father, strong to save” had appeared in the fourth line. Credit the compilers of Hymns Ancient & Modern with making an important, enduring decision, with a stronger grammatical structure, leading with the subject, “Eternal Father,” followed by explanatory clauses. Fig. 2. Louis Coutier Biggs, Hymns Ancient & Modern . . . with Annotations (1867). Revised text on the left, original on the right. Note that Whiting’s Latin translation is based on the revised version, not on his original. Whiting adopted some of the HA&M revisions and made a couple of minor adjustments of his own for other collections. 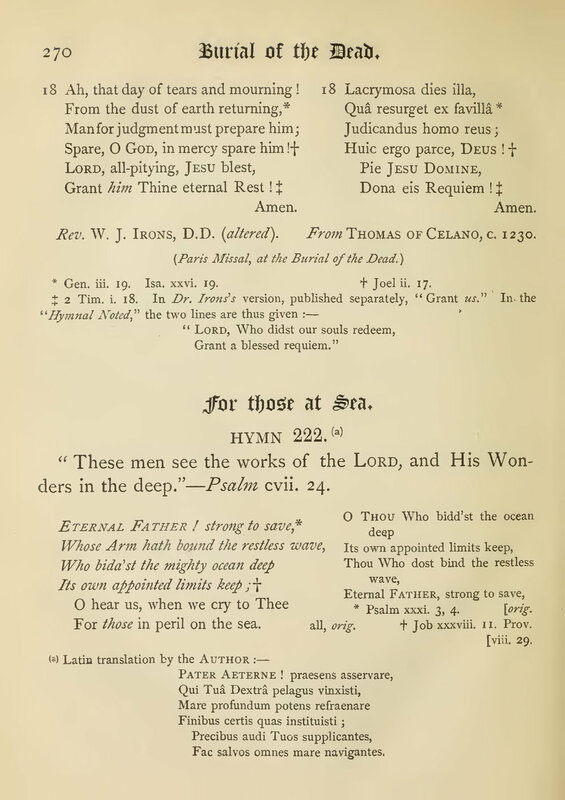 Some sources claim that Whiting made revisions for Psalms and Hymns for Public Worship (SPCK, 1869), but no available edition between 1868 and 1882 examined by this editor contains this hymn, including the 1869 edition. His final revised version is considered to be the one that appeared in Church Hymns with Tunes, ed. Arthur Sullivan (1874 | Fig. 3). Fig. 3. Church Hymns with Tunes, ed. Arthur Sullivan (1874). Stanza two of Whiting’s text alludes to Christ calming the sea in Matthew 8:23-27 and walking on water in Matthew 14:22-33. In stanza three, the author alludes to the movement of the Spirit across the waters in Genesis 1:2. In stanza four, Biggs saw echoes of Isaiah 43:2 (“When you pass through the waters, I will be with you; and through the rivers, they shall not overwhelm you”). Whiting may have also been inspired by Psalm 107:23-30, which describes perilous seafaring and divine rescue. Text: Development. Robert Nelson Spencer (1877-1961) adapted Whiting’s text, especially stanzas 2-3, to include travel over air and land. This was first published in the A Missionary Service Book (Fond du Lac, WI: Parish Press, 1937 | Fig. 4). Spencer’s version has been adopted into other hymn collections. Sometimes the opening line of his version has been changed to “Almighty Father, strong to save,” to avoid confusion with the original text. 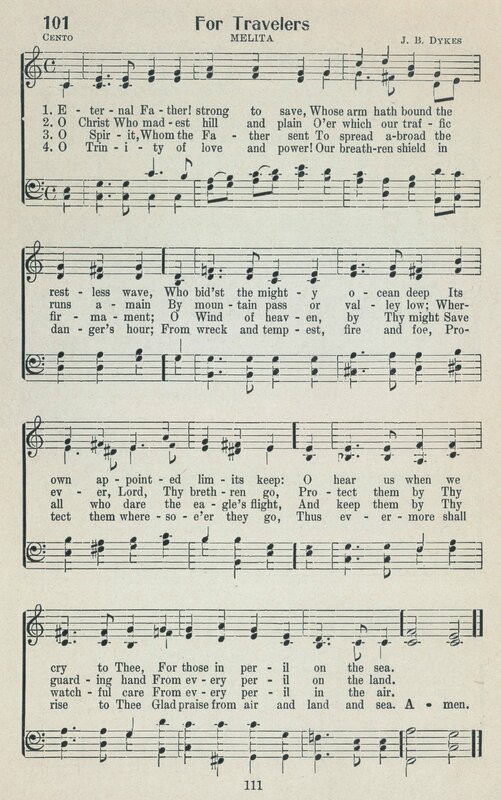 This hymn is often known as the “Navy Hymn,” because it has been adopted by the navies of both the U.K. and the U.S. This hymn has also taken on a number of other new stanzas written for the purposes of other organizations. Fig. 4. A Missionary Service Book (1937). Now when the south wind blew gently, supposing that they had obtained their purpose, they weighed anchor and sailed along Crete, close to the shore. But soon a tempestuous wind, called the northeaster, struck down from the land. And when the ship was caught and could not face the wind, we gave way to it and were driven along. . . . And on the third day they threw the ship's tackle overboard with their own hands. When neither sun nor stars appeared for many days, and no small tempest lay on us, all hope of our being saved was at last abandoned. . . . When the fourteenth night had come, as we were being driven across the Adriatic Sea, about midnight the sailors suspected that they were nearing land. . . . But striking a reef, they ran the vessel aground. The bow stuck and remained immovable, and the stern was being broken up by the surf. . . . [The centurion] ordered those who could swim to jump overboard first and make for the land, and the rest on planks or on pieces of the ship. And so it was that all were brought safely to land. After we were brought safely through, we then learned that the island was called Malta (ESV). In addition to the name MELITA (Malta) being chosen very carefully, the music also brilliantly reflects the concerns of the text, especially in the rising harmonic tension of a series of shifts (tonicizations) upward in the scale. This is a musical pairing that has served the text well, and will undoubtedly continue to serve it well for generations to come. Erik Routley, “Lord of creation,” Hymns and the Faith (Greenwich, CT: Seabury Press, 1956), pp. 79-86. “Eternal Father, strong to save,” Hymns Ancient & Modern, Historical Edition (London: W. Clowes, 1909).